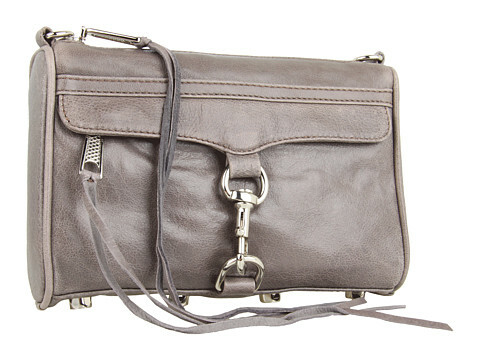 For a few months, I have been on the quest to find the perfect little crossbody bag. Although I love shoulder bags, my arms often get sore from lugging around what seems to be the entire contents of my life. I drive long distances for work, and so I like to keep everything I could possibly need in my bag. I'm trying to change this now, and maybe this will force me to condense things a little. 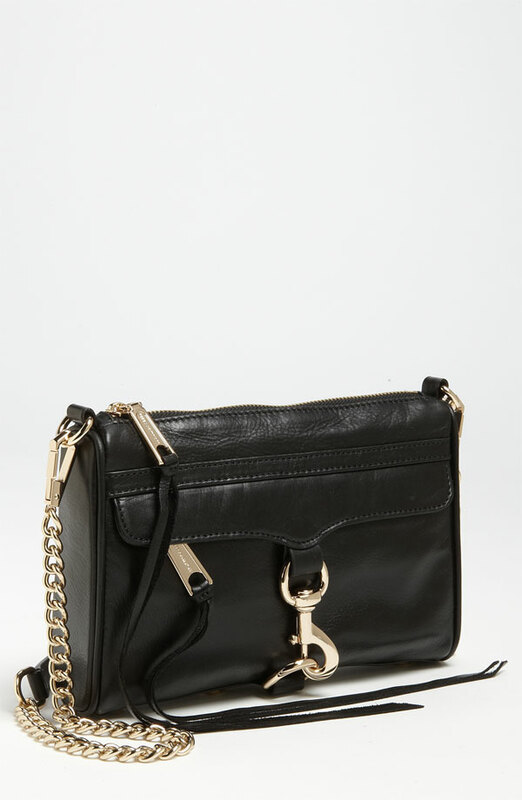 So ladies...the crossbody of choice is Rebecca Minkoff's Mini Mac. Functional, versatile, and the perfect size - I see myself carrying this to work, running errands, shopping, and on weekends when I'm out and about. Now, the only problem I'm having is choosing a color. A little help would be greatly appreciated! So what do you think? I'm not really leaning either way because ultimately they are both neutral. I like the black because it's classic. I won't baby it like I do with my Chanel. I also love the elegant gold hardware. Black is timeless, as well as basic. On the other hand, I like the charcoal because it is less expected than black, and I will still be able to pair it with many of the pieces hanging in my closet. Both will be great for Fall and Winter. Help me choose! I'd really love your honest input. Happy Friday! Enjoy the last day of Summer! Such a cute choice - either would be lovely. I would choose the Charcoal because it would go with both dark and light pairings . By the way...now I want a mini MAC too LOL! I vote black! I think it's so pretty and would go so well with so much. But I guess I would think about if you wear gold or silver more. Not that you have to match everything, but I think if you wear gold a lot more I would definitely go with the black bag because the grey one is much more of a silver look. I love this bag. I have a gold TB crossbody that I carry in all the same ways that you're talking about carrying this one. This looks like it might hold a little more, though. I pick the black one!! It's such a classic color and will go with about everything!! Check out the giveaway on my blog. At first I thought this post was going to be about the Mac Mini by Apple. Haha but this was a pleasant surprise! I would go with the charcoal. Black. To me it looks classier and more posh. Probably can't go wrong with either though! Love RM! I think I'd go with the Charcoal color. If you already have a black staple bag, it'd be nice to go with something in a different color. With the charcoal, it's neutral enough to be worn with brown or black. I'd go with the Charcoal color, it goes with everything as much as the black one does. I wear mine RM Lovespell with everything, which is pretty much the same color as the mini mac. I adore them both, but I'd go with the gray -- you could use it for every season and it's still pretty and neutral. That's a hard one! I love both, but would ask these questions. #1. Black mini mac is gorgeous, but since you already have a black handbag should you go with the grey to switch it up? 2. I always like the hardware to match what I normally wear for jewelry. I almost always lean towards gold, so will it both you if you have silver hardware but wear gold jewelry or vice versa? I would pick charcoal. I tend to lean toward gray for my standard neutral since it pairs so well with both black and brown. It it also a nice backdrop for brights I find. You just have to pick the right shades of gray. This is beautiful! For some reason, I always think that black and gold hardware just makes every bag look more elegant. It gets my vote. I like both, but my vote is the charcoal. I have a charcoal crossbody and it goes with so much. Thank you all so much for the feedback! At first it was very evenly split between the black and grey. Now I think the grey has taken over a bit! So that is what I'm now leaning towards :) I'm going to continue to read your comments until early next week and then pull the trigger on one. I figure that either way, I can return or exchange if I change my mind. But since both are calling my name, I guess I can't really lose! I'd get them both. But if I had to choose, I'd go for the black one. It's more versatile. I would go with the charcoal! Didnt you say you had a black chanel already? Seems like charcoal is winning, however I am in love with black, & now especially anything with black/gold.